This email is going to be a unique one. I thought that it would be great to send out a report from the first 6 months of my mission. Just going over a lot of the great experiences I’ve had, blessings I have seen, trials I have overcome. So here is a summary of the past 6 months as a Missionary. Whew, the MTC feels like forever ago. Now looking back, being at the Provo Missionary Training center was a great experience. The best “real life” way to describe it is… It’s basically high school. The whole schedule, cafetería, drama, immaturity, and messing around is a lot like high school. When I first got to the MTC, I was put in a trio with Elders McCann and Johnson. Elder McCann is currently in the Puebla México North mission, and Elder Johnson is (spoiler alert) actually here in the same district as me here in Houston! The first couple of weeks there went by really slow. Just getting used to missionary life and the whole schedule. After 2 weeks, our trio got split up because one of the Elders in our district went home. Elder McCann and I struggled a lot to get along for the rest of the stay. I felt like an outsider because I tried to be obedient as best as I could. I learned a lot about the importance of obedience in the MTC. I messed up my shoulder playing basketball one day, and had to go to physical therapy for a couple weeks, which was a bummer. By the time I left the MTC, my Spanish was alright. I could teach the basics of all the missionary lessons. And I wanted to get out of there bad by Week 5. But it was a good experience. Best moment: Heart-to-heart with Elder McCann. After a particularly hard day, I sat down with my companion and asked him this simple question: “Why are you here on a mission?” At first he seemed offended, but as I answered the question myself, we both started to tear up. I wanted him to succeed so bad, but it just seemed like he was working against himself. I told him the Savior loved him and NEEEDED him here on the mission. It ended with a hug and going back to work on Spanish. Recently, Elder McCann and I were emailing back and forth. 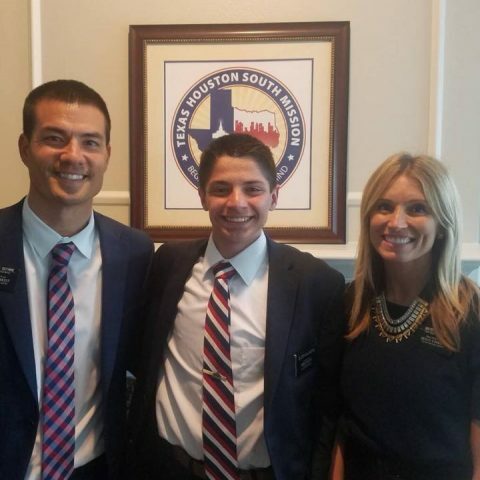 He is serving in the Mexico Puebla North mission, and he just had his sixth baptism. Hardest Trial: Being obedient. It’s very easy to fall into the trap that because everyone else isn’t doing it, you don’t have to either. That is a lie from Satan. Obedience is of the upmost importance, even in the MTC. It is really hard, and I struggled a ton with balancing being obedient with being liked by my roommates. What I discovered is that there is no balance: “Fear God more than man” is the simple yet sufficient solution to the dilemma. When I hopped off the plane in Houston, I thought I was going to die of the humidity. That night, I met my trainer Elder Stites. What a legend. I love that man so much, he’s one of my best friends. We had so many fun times, a lot of fighting against the forces of evil, and tons of spreading the Gospel of Christ. Best moment: Elder Holland. Elder Holland came and spoke to all 3 of the Houston missions. We were able to look him in the eyes, shake his hand, and introduce ourselves. His eyes pierced my soul, and I learned that he truly is a servant of the Lord. It was an amazing experience, I am grateful for the impact his words have had on me since. Hardest trial: Adjustment. At first I thought I was doing fine, but after about 2 weeks I felt really alone. I struggled with a lot of dark thoughts and wanting to go home. I felt thrust into a different country: that’s basically what my area is. It’s heavily Hispanic, even the stores and everything are in Spanish. Even though I was still in the United States, the new environment, plus new lifestyle of missionary work, really threw me for a loop. What a blur. I remember that on Halloween we had district council but it was raining really hard so when Elder Stites and I got there, we were totally soaked in our suits. So we didn’t wear socks or shoes for that district council. That district council basically described the rest of the transfer. We went through a really hard time because of unfortunate circumstances that I shouldn’t get into. But Elder Stites and I stuck together and by the time he left the area, we were like brothers. I spent the last 2 weeks of the transfer in a trio with the other Elders of my ward. It was interesting to say the least. Best moment: Juan Carlos. When I was with the South Elders for 2 weeks, we met this one kid from Colombia named Juan Carlos. He was living with a member for a few months to learn English here in the United States. This kid was golden, he is 18 years old so we were just like best friends. Then he got baptized like a few weeks after we met him. It was fire. Hardest trial: Elder Stites’ emergency transfer. Whew what a struggle. It was hard to see my trainer leave the area early because of some external problems that were faced. I know that is really vague, but just know that the forces of Satan are constantly attacking us, and luckily Elder Stites’ was so strong that he fought them straight on for several weeks. Dang this transfer was difficult. I was called to train a new missionary right after training. At very first, I was excited; soon that excitement turned to being overwhelmed by the calling. I struggled to train Elder Freebourn. I didn’t have enough confidence in myself to help him build up his own confidence. I learned to rely heavily on the Lord during this time. Prayer was my best friend. Fortunately, things began to clear up as I was able to realize my purpose as a trainer and missionary more and more. Best moment: Christmas Conference. At Christmas Conference, we got to listen to amazing talks by President Guthrie’s mission president and companion from when HE served his mission in Madrid Spain 20 years ago. We watched The Best 2 Years, the GOAT. We reenacted the nativity which was tacky but it’s all good. I ate 2 full steaks that were the best steaks ever. And we received our Christmas packages from our families! It was such a fun time, and made me feel a lot better in a season that was hard. Hardest trial: The car accident. Three hours before the Perdomo family was supposed to be baptized, the dad’s brother (who is a member of the ward and was actually going to be the one performing the ordinance) and his wife were in a car accident. They got rear-ended and their car was totaled. It left them decently injured but really shaken up. The baptism was canceled last minute. That really hit me hard. It sent me into a tailspin that led to a lot of anxiety about things going wrong. Now looking back, I’m really glad I was able to learn patience and trust in the Lord through this trial. Here we are. As of today (February 11th), there are two weeks left in this transfer. This transfer has been the best so far. A lot of things have been going right, and Elder Freebourn has learned so much this transfer. Best moment: The Perdomo’s baptism. This baptism was such a special experience and brought me so much joy. I love the Perdomo family. When their baptism got delayed as I described above, it really made me worry. But the wait was worth it: seeing this family be baptized was such a spiritual witness for me that the Lord has a plan for me in this work of His. Hardest trial: Being diligent. I’ll admit, this transfer I have always been exhausted biking for 6 months straight has taken a little chunk out of me. But at least I can now appreciate a car when I get one! But because I have been tired and sick a good amount, we haven’t been able to work as much. Yesterday we actually had a really hard-working day, and I am going to strive from now on to always have days like that. I know the Lord will give me strength to do what He needs me to do. Wow thanks for making it this far. Hopefully you have had a tiny bit of insight into some of the experiences I’ve been able to have during these amazing months. I’d like to close by writing out part of my testimony. I bear witness of Jesus Christ. He is our Lord and Savior. He indeed came to this earth, taught His gospel, established His church, and performed many miracles. Out here in the mission, I have developed a strong witness of His Atonement. I know now without a shadow of a doubt that he suffered, bled, and died for our sins and pains. As I proclaim His name, I marvel at just how far His hand extends to every soul in existence. Through Him, we are able to be made clean again. Through His Prophets that He has called, we are able to know the truth of His gospel. I have had my doubts, but as I have looked unto Him in every thought, those doubts have been swept away and I have learned to not fear. I testify that Joseph Smith was called by God to restore these truths. There is only one true church on the earth today: that is The Church of Jesus-Christ of Latter-day Saints. I love this all. I am grateful for the opportunity to represent my Savior, and I say this in the name of Jesus Christ, Amen.